In this post I want to look at some of the visually oriented tools and techniques for learning words and phrases in French for speaking. One way of memorizing words and sentences of a language is to see them repeatedly in writing. This is what I call visual repetition. I’m sure most of the readers here have a ton of written material in printed or electronic form on and in French. All of that is good but the problem is that most of the time this material is not in front of you either when you want to use it or even just to memorize it for later use. I may be a bit old-fashioned, but I strongly feel that the number one visual learning tool is a little notebook that can fit in a pocket or a handbag. Even though all this can be done on a smartphone, I like the physical act of writing out the words. 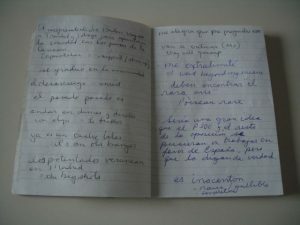 The idea of the notebook is to take with you a collection of words, phases or notes that you can review and memorize when you have some free time. It’s also great for jotting down things that you see or hear. – Vous voulez un sac / Vous avez besoin d’un sac? – Non merci, j’en ai un déjà. / j’en ai déjà un. The point of grammar you want to work on here is probably the pronoun en. Next time you’re waiting in line at the supermarket, you just glance through the notebook and find the phrases you want to use. 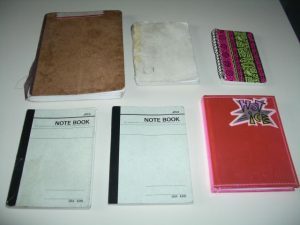 The problem with notebooks is that the contents are organized in a linear fashion. You can jump around of course, but the material is always in the same sequence. Flashcards eliminate this problem. As you probably know, paper flashcards are index cards or small pieces of paper that contain content in the target language on one side and usually the translation on the other side. The cards can be organized in any thematic order and then into stacks. Like working with notebooks, you take a stack of flashcards with you and review them when you have a moment. The great thing about flashcards is that you can pick and choose what you want to work on at a given moment. This is also very useful when working with a tutor and you want to use specific items. La maison se voit de loin. The house can be seen from afar. Est-ce que ça se mange? Can this be eaten? Ce vin se boit frais. This wine is to be drunk chilled. Ces choses ne se disent pas. These things should be left unsaid. When I have some time, I review these cards, possibly reading them out aloud or in my head. I’ll also try to invent variations of these examples. I could make annotations, add other examples or highlight particular words. Electronic flashcard systems are a very popular alternative to the rather cumbersome stacks of paper cards that have a nasty habit of falling on the floor. One of the most popular products is Anki that I use. An advantage of electronic systems is that you can buy or download pre-made decks that you just modify or add to. You can also easily add material from online sources by cut and paste. Although I appreciate the convenience of electronic flashcards, I also like paper flashcards because it is easy to write on them and make additions or notes. Fine examples of visual repetition tools, colourful wall charts for languages are widely used in classrooms, especially at the elementary school level. Typical subjects are: les légumes, les fruits, les animaux, les saisons, les mois de l’année, les couleurs, le corps, les émotions, l’alphabet, etc. I like these wall charts because they catch the eye but I’ve noticed that nearly all this material is aimed at beginners. I’ve never really seen anything for advanced learners. A great feature of flashcards is that you can lay out multiple cards simultaneously. This is something I use a lot. 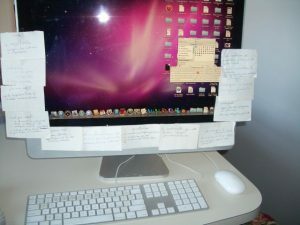 In the accompanying photograph I’ve taped some cards to my computer screen. This is a true example of visual repetition because I spend many hours a day in front of the computer. I change the cards once or twice a week. It’s a bit primitive and messy, I’ll admit, and some of the cards get in the way of the screen but this system is very effective. I find this setup particularly useful when I’m working with my tutor over a video-conferencing system like Skype. It works as a kind of teleprompting system where I can lay out the words and expressions that I want to deliberately practice during our session. Similarly, cards can be put on bulletin boards, cupboard and refrigerator doors, basically anywhere the contents can be seen in a glance. As the photograph shows, every time I open the fridge door, I inevitably glance at the flash cards. The idea of laying out flashcards so they can be seen as thematic group is of course what led to the calendar learning tool concept. 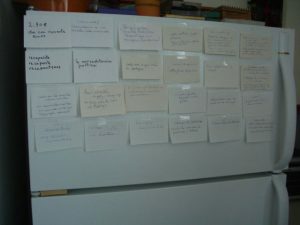 What started out as 35 flashcards on a refrigerator door became a large printed sheet of paper and then the full-blown calendar. A couple of features were incorporated into the final calendar idea: there is a clear progression from informal and spoken language to the more formal and written form; dialogues can span multiple flashcards. The examples can be designed so as to highlight certain linguistic features in adjacent cards. It takes a fair amount of work to put a sheet of 35 flashcards together but anybody can make there own. This is not by any means a replacement of the flashcards as a stack of individual cards. It’s really meant as a tool to focus on a particular point of interest. The biggest drawback of the calendar or grid of multiple flashcards is the lack of portability. It’s meant to be put on a wall or next to the computer where you can glance at it repeatedly. One solution to this problem seems to be the pdf version of the calendar on a tablet computer. I haven’t yet experimented fully with this solution myself, but it sounds very promising. I’m thinking it could work really well for those video-conference sessions where I could keep the prompts right on the screen. Staring at flashcards or wall charts must not be a mindless passive activity. In my opinion the real power of these tools lies in actually using them for speaking. I use them as prompting devices. When practicing with a tutor or a conversation partner this material can be used in a deliberate fashion. I plan in advance to use certain expressions, word or grammatical forms that I’ll have in front of me. I will have practiced saying them a few times of course. Then it’s a matter of working them into the conversation. As useful for memorization as these various visual tools can be, they are only one part of the strategy for learning to speak well. Visual repetition should be combined with repetitive listening and repetitive speaking that we’ll examine in the following posts. Stanley Aléong is a polyglot, author, musician, language coach in French, English and Spanish, language workshop facilitator and organizer of French-English conversation meetups in Montreal, Canada. He likes to share his passion for languages and believes that anybody can learn to speak a foreign language well with the right methods and tools. He has also invented a cool visual learning tool called the Essential French Wall Chart Calendar. Reach him at info@fluentfrenchnow.com.